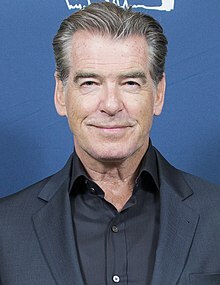 Pierce Brendan Brosnan (born 16 May 1953) is an Irish-American actor. Brosnan holds both Irish and American citizenship. He was born in Drogheda, County Louth. He used to play the part of James Bond. He played the roles of Mr. Brunner and Chiron in Percy Jackson & the Olympians: The Lightning Thief, Stu Dunmeyer in Mrs. Doubtfire, and was in Mamma Mia!. This page was last changed on 18 January 2018, at 08:34.